Jeff For Banks: Does "Evaluate Strategic Alternatives" mean the end of your bank? Does "Evaluate Strategic Alternatives" mean the end of your bank? 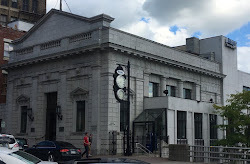 There is a lot of soul searching happening in the executive suites and boardrooms of community financial institutions (FIs). Nearly three years of economic malaise, political activism, media vilification, and regulatory over-reach have made us weary of continuing as an independent FI. When Boards or CEOs reach this point, they determine to undertake a review of their "strategic alternatives". I recently spoke at a Financial Managers Society meeting packed with FI CFOs and controllers and asked the crowd what they thought "evaluate strategic alternatives" meant. In unison, they responded "sell". But should a board, in exercising their fiduciary duties, perform this analysis routinely without determining to sell the FI first? A rhetorical question because the answer is obvious. But what should such an analysis entail if it is to contain an assessment of the FI's strategy, the value of successfully executing such a strategy, the possibility of acquiring, or in the absence of opportunity the value that can be received in a sale? The first step, not often taken, is to develop a present value analysis of the FI's strategic plan. What do you compare the value in a sale to if you do not perform this analysis? See below for a version that we often use in determining the present value per share of an FI. In the chart, I projected out five years. Why five? Many executives think it involves too much guesswork when projecting so far into the future. True about the guesswork, but you must assess the amount of time your strategy will take to fully realize its value. Strategy execution typically lends itself to a long-term view. 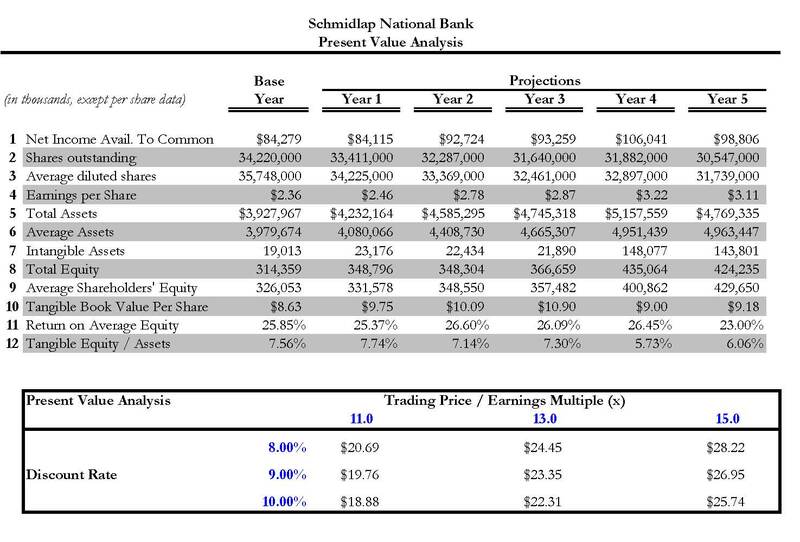 The above analysis places a present value per share on Schmidlap's strategic plan at $23.95 using a 13x earnings multiple and a 9% discount rate. These two factors are important and the FI should use empirical data to determine the earnings multiple and discount rate. For example, in a strategic planning retreat I performed such an analysis on a client using a 12x earnings multiple, to which the CFO took exception. Upon reviewing 10 years of trading history I discovered he was correct, and the appropriate multiple was 14x. This had a meaningful impact on value. The discount rate is often a point of contention among executives, board members, and industry analysts. I will not pull out my business school textbook and go through a Cap-M exercise (because I would have to find my textbook to accurately do so). In its simplest form, the discount rate in the above sample should be the shareholders' expected capital appreciation of the FIs stock. If shareholders expect a 10% total return from holding this FIs stock, and the FI pays a 2% dividend yield, then the discount rate should be 8%. Once the FI performs a present value analysis of its business plan, it should assess the M&A market and the value it can receive in a sale. But there should be an additional step: assessing the potential stock price appreciation of a would-be acquirer's stock after the acquisition. In many if not most cases, the selling FI shareholders will be invested in the acquirer. A textbook case for celebrating the "pop", or premium price received by a seller to celebrating the blues post-transaction because the buyer's prospects and stock tanked was First Union's (now owned by Wells Fargo) acquisition of CoreStates in Philadelphia. Had CoreStates assessed the potential for a post acquisition First Union, perhaps disaster could have been averted. Don't put your FI in the same situation. But evaluating strategic alternatives should not only be about a sale or remaining independent and executing your plan. What about a "buy"? Your FI should identify potential targets for their ability to propel your strategy, build economies of scale, and accelerate earnings growth. It is less complex to execute strategy without having to negotiate and integrate an acquisition. So acquiring should accomplish the above objectives, particularly if the present value of your business plan is trumped by your takeout value. Then you have what I term a "strategy gap" that must be filled by either/or: faster organic revenue growth, cost savings, and/or acquisitions. All should be part of your regularly scheduled strategic alternatives meeting. I recently heard a respected investment banker predict that the 8,000 banks/thrifts in the United States will decline to 5,000. Bold prediction, to say the least. If we are to take faith in it, then there will be a lot of "reviewing strategic alternatives" happening in upcoming board meetings. But in performing such an analysis, the FI should assess the present value of its strategy, determine the reasonable value it can receive in a sale and the prospects of would-be buyers, and the opportunities to acquire to fill "strategy gaps". Looking at only one aspect of the above will only shortchange your employees, customers, and shareholders. How does your FI perform a "strategic alternative" review or what do you think should be included in such an undertaking? 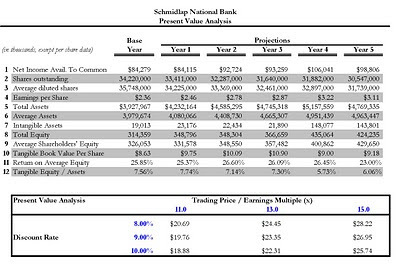 Note: The above present value analysis was performed on an actual FI, using actual historical numbers from 2001 (base year) through 2006 (five year projected years). The FI was trading at $39.57/share on 12/31/01, the base period. Therefore, the strategy eroded value over time, primarily because earnings grew at a 3.23% compound annual growth rate. To be fair, the FI made an acquisition in 2005 which may have resulted in a temporary downtick in earnings.